From time to time we all need a little help figuring out some aspect of the Genius Hub smart heating system. 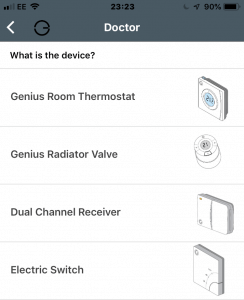 The Genius team, over the last few years have been training the in app Doctor to guide you through troubleshooting the typical issues and it get’s even smarter with every app release. You can find the doctor by clicking on the 3 dashes (burger) in the top right corner of the app. This shows you a dropdown menu and you will notice the Doctor below Manuals and above Feedback in the menu. Select the Doctor. Select the device you are troubleshooting and follow the on screen prompts as it takes you through a step by step guide. The Doctor is smart and will talk to your Hub to try and help with your troubleshooting. If for some reason you are unable to resolve the problem with the Doctor then you can always check the forum, documentation or request a support call back.